The DataPort DP27 removable drive is designed to fit into slimline optical disk drive bays, one of the most commonly found drive bays in computers today. That means that the DP27 can be installed into workstations, desktops, laptops, all-in-ones, government technology, or any other type of device. The DP27 ingests 2.5” hard drives or SSDs with the speedy 6G SATA interface. 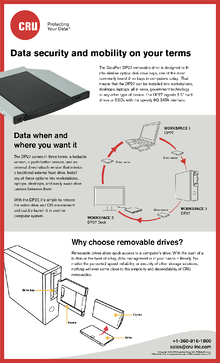 A little over a year ago, we posted an infographic about the DP27 and its many uses to this blog, and it has since become one of our most viewed entries. However, over the course of the year the DP27 has become even more versatile and powerful, with new variations making data security and transport even easier. To reflect all that the DP27 can now do, check out our all-new infographic! This entry was posted in Desktop Storage, Storage Systems, Small Business, Data Backup, Removeable Drive, Data Security by H.G. Blakeman. Bookmark the permalink.